There's a new computer for your bicycle available this season, from CatEye, our most trusted go-to brand of electronic accessories. It's called the Commuter, because it's got extra features geared to those who ride a bike for commuting, transportation, errands, and utility. First of all, it's a wireless computer, which means easy installation and clean looks. It's got all the features most people want in any computer: current, average, and maximum speed; trip distance, total odometer, ride time, and time of day. It's also got a pace arrow, which tells you if your current speed is higher or lower than your average speed. To help make your commutes easier, the CatEye Commuter also tells you the temperature and your ETA (estimated time of arrival) in both actual time and in a bar graph. It's also got a calendar. 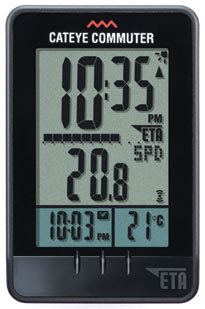 To keep tabs on this information during early-morning or night-time commutes, it's also got a backlit screen that can be set to auto-off mode or always-on mode (keep in mind that excessive use of the backlight shortens battery life). Finally, it gives you a report of your carbon offset (Drew's favorite feature). The FlexTight mounting bracket provides easy tool-free installation on most stems and/or most handlebars, from 22.2mm to 31.8mm in diameter. The CatEye Commuter is $69.99 and is now in stock in all three Century Cycles stores, as well as online. Just needs a map function and a bike charging system and it's perfect. What's the carbon offset? Like how much you affect your carbon footprint (or reduce it)? How does it calculate this? Yes, how much carbon you reduced by biking instead of driving, based on an average of 240 grams per mile.